Bartlett pears and cucumber come together in our cooling summertime soup. 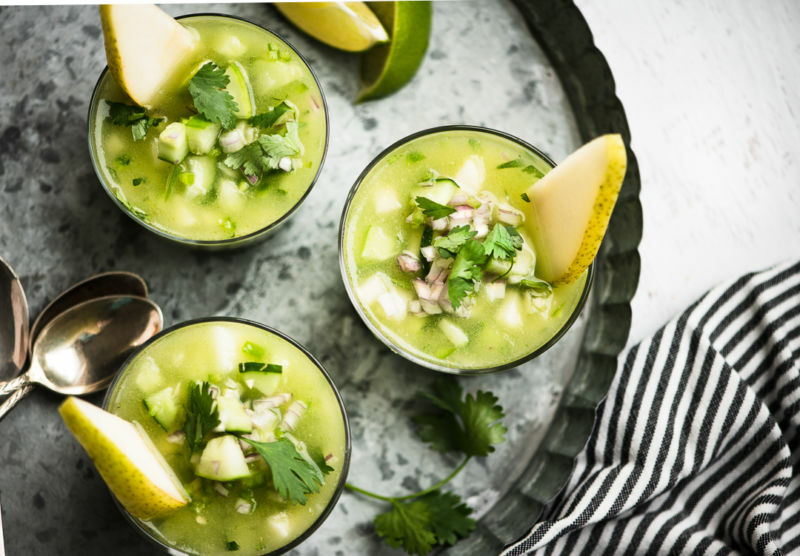 Cucumber and pear gazpacho can be served as an original starter or sipped on its own as a main. Use our kitchen hack to keep your pear slices from browning before you use them for garnish. 1. Set aside one cup of the melon and 1/2 cup of the cucumber. 2. Combine the rest of the melon and cucumber in a blender and blend until very smooth. 3. Pour mixture into a bowl and add the remainder of the ingredients: diced Bartlett pear, reserved diced melon and cucumber, lime juice, shallots, cilantro, vinegar, jalapeño (if using), olive oil and salt. Mix well and chill in the refrigerator for at least an hour. 4. Serve well chilled, garnished with sliced pears, cilantro, and shallots. * The taste will differ depending on how sweet your honeydew melon is. We recommend tasting the soup and making adjustments to suit your tastes with salt, lime juice, cilantro, etc.